Products / The Red, Red Wine Box --- OUT OF STOCK! One Of Our Best Sellers! This Box Is Full of Everything a Red Wine Lover Needs! 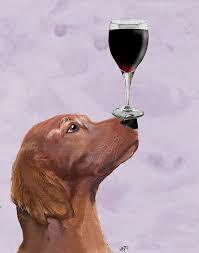 For The Loving Human: 4-6 Items Designed Around Red Wine and Dogs! For The Lucky Dog: A Bottle of Red WINEDOG, Treats and Festive Toy!